The surprising discovery made in a national park near Yellowstone made local officials close off parts of the park fearing for people's safety, while scientists claim that they have nothing to do with the Yellowstone volcano. Mammoth rock cracks have been noticed in Grand Teton National Park in the US state of Wyoming, which is connected to Yellowstone. According to Denise Germann, a spokeswoman for the park, guides noticed huge fractures in the Hidden Falls area. "And when they [rangers] went to investigate they realized it had actually gotten bigger and expanded," she said. The size of the cracks running along a rock wall about 30 meters high in Hidden Falls differed from that of usual fractures, having been estimated at nearly 30 meters in length, Germann added. The park service temporarily shut down Hidden Falls and a neighboring area, citing "human safety" concerns. 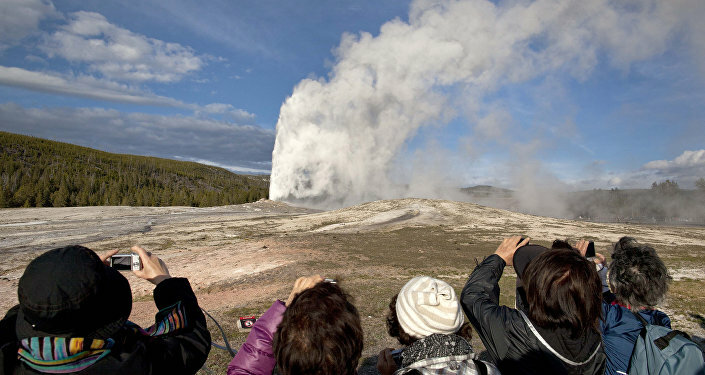 Following reports about the discovery, the National Park Service quelled fears of an eruption in Yellowstone, saying that the fissure and associated closure were "completely unrelated" to Yellowstone volcano. Grand Teton National Park is located in a geologically active area 16 km south of another national park, Yellowstone, which sits over a giant active volcano. The last eruption in Yellowstone took place some 630,000 years ago. Seismic activity in Yellowstone is said to be responsible for a constantly shifting ground and myriad daily earthquakes.